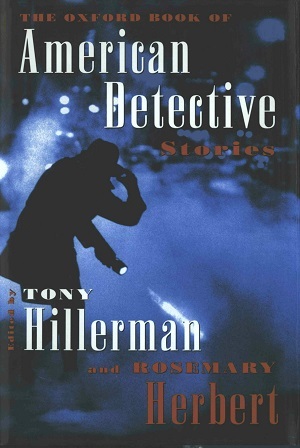 This is the first edition hardback edition of The Oxford Book of American Detective Stories, which was published in 1996 by Oxford University Press in New York City, New York. The cover art, by Ted Ancher, features blue tinted photograph of a man in a hat using a flashlight to search for something in a dark and misty street. Format: Hardback, 22 x 14.7 cm. Binding: Blue boards with the editors, title, and publisher's logo surrounded by a border printed with gold on the spine. The front boards also have the title and a border printed in gold.